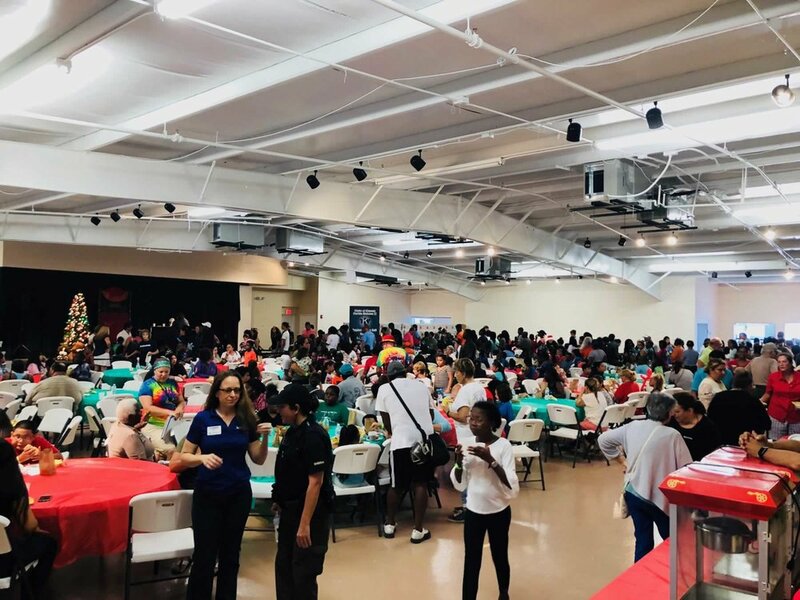 Saturday, July 28, 2018 marked the third annual Kiwanis Christmas in July event and as I watched the room expand with love, I held back tears of joy. 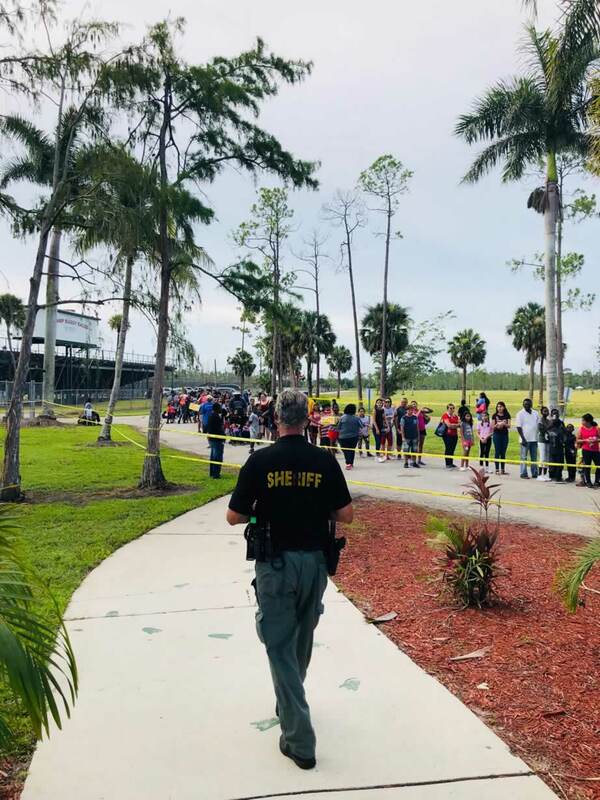 2500 homeless and at-risk students and their families were registered and selected from the Collier County school system to participate in a beautiful event. 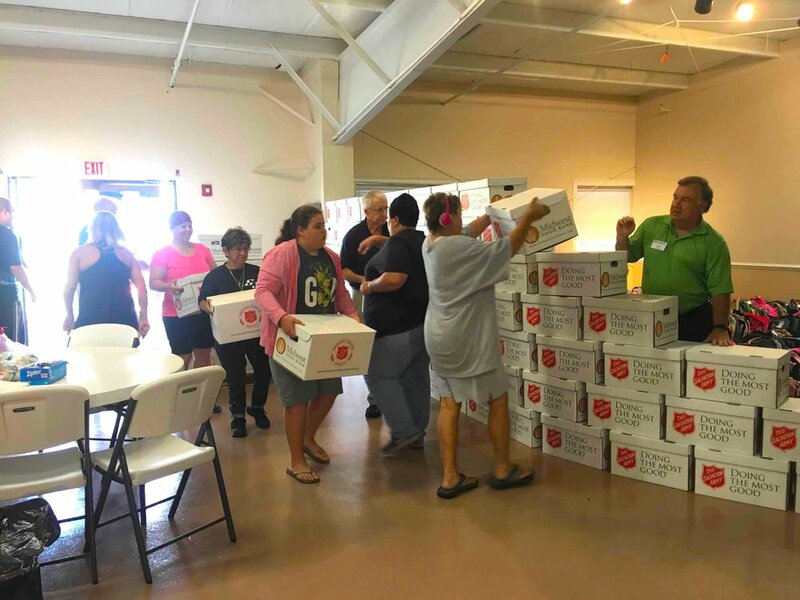 In 2016, nine Kiwanis Clubs of Collier County united to launch a local campaign of “Christmas in July” designed to give students who are homeless or at risk of being homeless in Collier County the basic necessities of clothing, shoes, backpacks, school supplies and personal care items so that they have the opportunity to start the new school year off with a positive light and focus on their schoolwork. 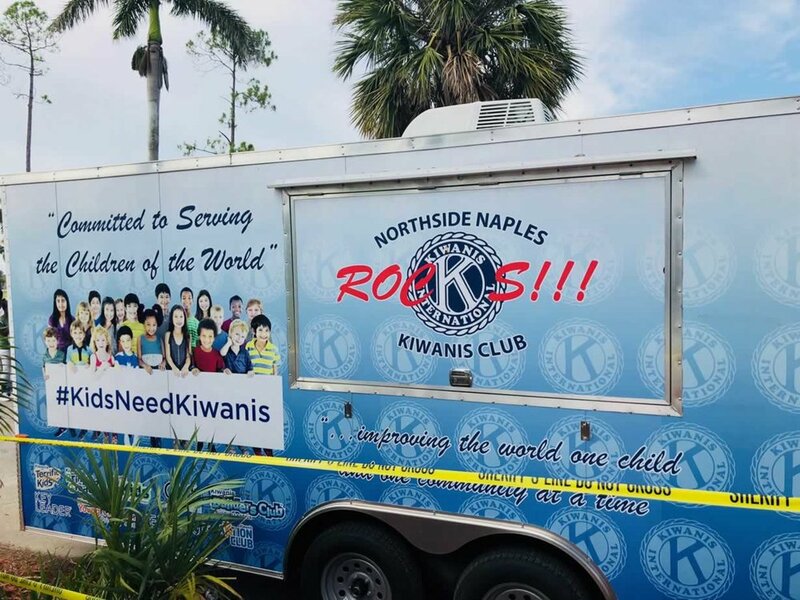 Families were greeted at the door of the Florida Sports Park by smiling and caring Kiwanis members who ushered them into a picnic lunch extravaganza of hot-dogs, freshly made popcorn, potato chips and delicious Kilwen's ice cream. The glee and hope in their eyes was electric. Ho Ho Ho and a room full of JOY. Photo by Sarah Dudley Wayne. The day before I helped pack backpacks with clothing and other personal items and marveled at the 200 shiny 2-and-3 wheelers which Bikes for Tykes donated. Just getting the bikes ready for new homes and adjusting bike helmets to fit the kids was a big job on its own. In all my years volunteering I have never seen a more smoothly operated large event like this one. While families waited patiently in a long line for various supplies, there was excitement in the air everywhere I looked. 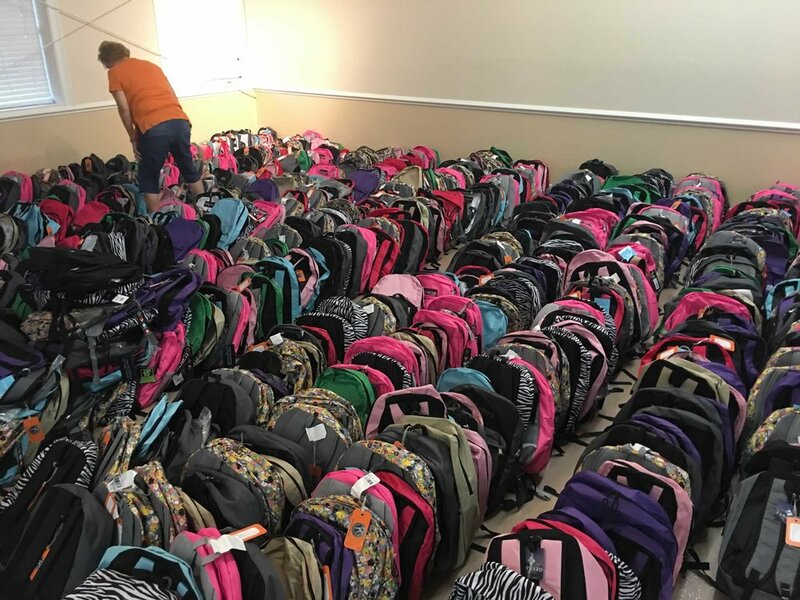 Backpacks of every color were custom filled with everything each child could need for the upcoming school year. Kiwanis members tagged each backpack with the name and clothing sizes for each student, appropriately for their grade. Families were able to hand select school supplies and some were also registered to receive a bike that they could take home right away. The experience which impacted me the most was meeting a tall 15 year old who was wearing a math competition T-shirt with an illustrated wired brain. Curious, I asked him if he liked math and in a quietly composed manner he told me he competed in the competition. Later, when I walked around to the tables where families were enjoying their lunches, I spoke with his mother and siblings. They all verified he was a math wiz and were excited to be at the event, meet Santa and also hoped to get a bike. Talking with this young man reminded me that we never know when we meet anyone—whether privileged or at-risk—what future opportunities lay ahead for them. On meeting this confident young man I immediately saw the impact of the event. We've heard it many times—unless we walk in someone else's shoes we can never know circumstances different than our own. These young people hold much promise to collectively help solve future societal problems, locally and globally and they need support from caring people who provide a hand-up in the community. Some could view an event like this as a bunch of free give-aways. I see it as an investment in the lives of those who have the potential to make a difference in our world as they grow and mature. They may come from lesser financial means, yet they are worthy of support to bring them to a place where they have the ability to make a social impact of their own. That’s what a ripple effect is. No matter what your background, when you see empathy and compassion in action, it is a moving experience. 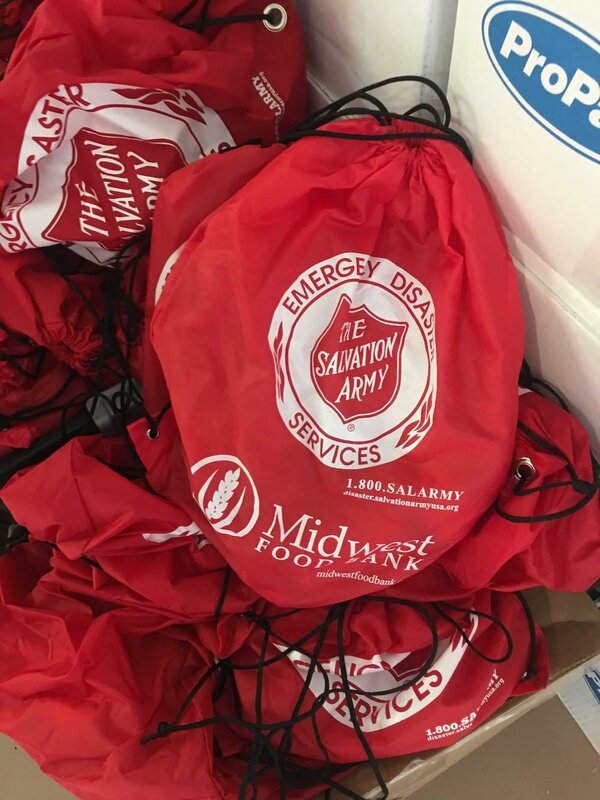 I have complete trust the children and families at the Kiwanis Christmas in July will have a long memory of what it feels like when a community cares. As a community and a nation, it is important to look on the side of optimism and strive to support the good we see in life. Let’s also not forget how essential our teachers and administrators are—they closely watch out and nurture our young people. They need to be appreciated and applauded for their daily hard work. The Kiwanis Christmas in July is proof that public-private partnerships are fundamental to the growth and public good of our community, and to raise rising stars of the future. Next year, be sure to Sponsor an Angel, or two.